Corrison X now offered in a spray bottle. This is great for when you need to coat the surface of your electronics or your motor to help keep corrosion away. Each bottle is 16 oz. CorrosionX is the most advanced and effective corrosion prevention compound, lubricant and penetrant in the world! Although it may look like a typical oil-based anti corrosion spray, CorrosionX utilizes a revolutionary technology called Polar Bonding that does far more than merely slow down the corrosion process like those so-called 'corrosion inhibitors'. Corrosion X actually kills existing rust and corrosion (keeping it from spreading) and provides long-term protection against rust and corrosion on any metal surface. Corrosion X is the only product available to the public that meets the US Navy's tough new corrosion prevention and control performance requirement ( MIL-PRF-8109F ). Due to Polar Bonding, CorrosionX causes common metals and metal alloys such as iron, steel, stainless steel, aluminum, copper, brass, bronze, etc. to chemically behave more like noble metals such as gold and platinum. In other words, as long as CorrosionX is present on metal, it can't rust or corrode! CorrosionX also has a dielectric characteristic, so it's safe on electronics and completely shuts down electrolysis between dissimilar metals. 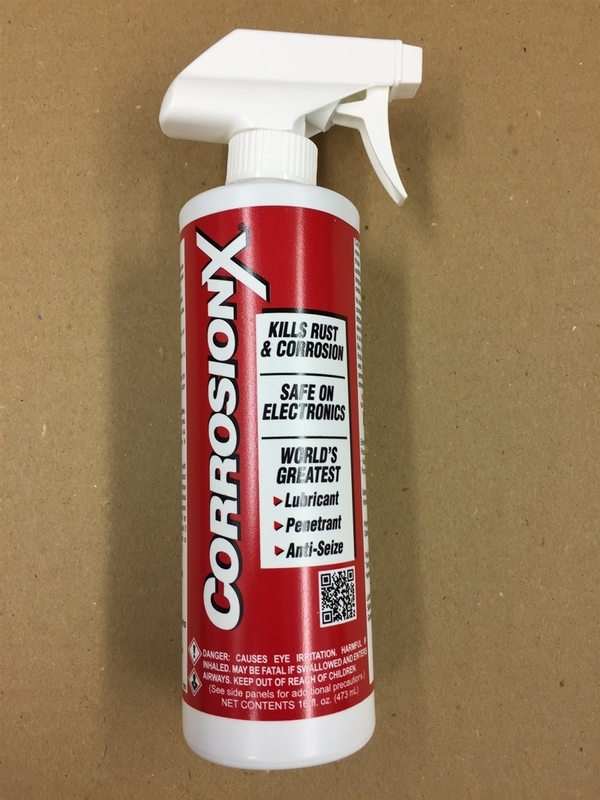 Use CorrosionX wherever you want corrosion control without paint or wax coatings. A light spray of CorrosionX on power heads, generators sets and engines a couple of times a year will keep them looking like new – even in saltwater and coastal environments.